You wouldn't think a martial arts movie featuring Tony Jaa, Michelle Yeoh, and Dave Bautista would be dull. 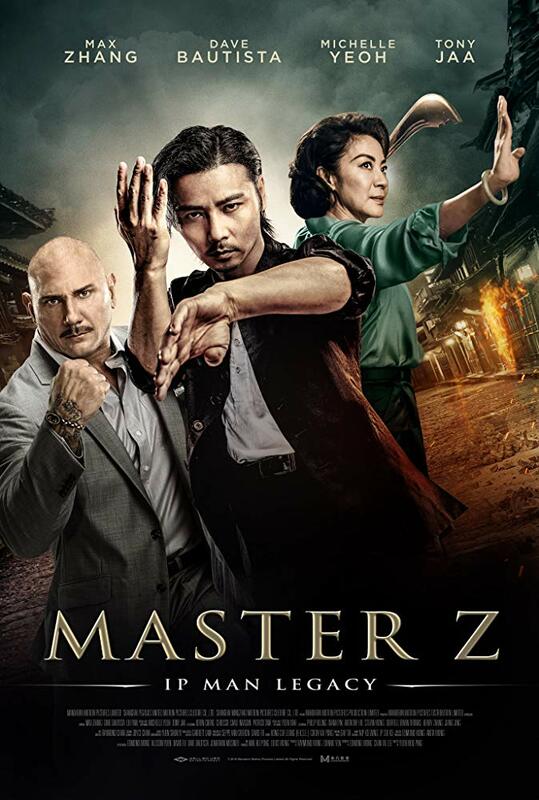 Here's Master Z: Ip Man Legacy to prove you wrong. The latest installment in the popular franchise has a few lively action scenes but mostly plods along in a lethargic manner. Every time it feels on the cusp of coming to life, the pace slows back down, leading to disappointment. Cheung Tin Chi (Max Zhang) is a former martial arts master/mercenary who runs a small grocery store and cares for his young son. His retirement plans go awry when he helps two women, Julia (Yan Liu) and Nana (Chrissie Chau), fight off an opium-dealing gangster and his goons. Tin Chi soon finds himself targeted by the gangster's sister, Kwan (Yeoh), an assassin (Jaa), and an American restaurant owner named Owen Davidson (Bautista) with a few secrets. The appeal of a movie like Master Z: Ip Man Legacy, of course, is witnessing elaborate fight sequences. There are a couple good ones here. The best finds Tin Chi fighting off a bunch of assailants while they all jump between the suspended neon-lit signs of shops and restaurants on a busy street. Technological advancements, specifically the ability to digitally erase wires, allow director Woo-Ping Yuen to have the characters defy gravity in the most amazing of ways. A later fight between Tin Chi and Davidson is appropriately, wince-inducingly brutal. Master Z's problem is everything else. The story goes in too many directions at the same time – I've left multiple subplots out of my summary – and is subsequently disjointed. All the various threads feel perfunctory, too. The film's heart is clearly in its action, not its plot. You won't find anything here that hasn't been done before. Additionally, interesting characters like Kwan (who wants to turn her criminal enterprise legit) and Davidson are underdeveloped, leaving their arcs unfulfilling. Half of Master Z: Ip Man Legacy is reasonably entertaining, while the other half is slowly paced and uninspired. With this stellar cast, the picture could have been an action-packed blast. Instead, the violent mayhem just proves a welcome, yet infrequent respite from the tedium of the half-baked story. Master Z: Ip Man Legacy is unrated, but contains violence, drug content, and language. The running time is 1 hour and 47 minutes.